Mark Fenton is a national public health, planning, and transportation consultant, an adjunct associate professor at Tufts University's Friedman School of Nutrition Science and Policy, and former host of the "America's Walking" series on PBS television. He's author of numerous books including the best selling "Complete Guide to Walking for Health, Weight Loss, and Fitness" (Lyons Press, 2nd edition 2008). 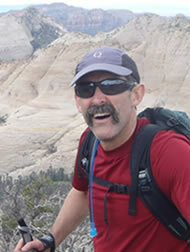 He was a developer of the University of North Carolina's Safe Routes to School clearinghouse, and facilitator for the walkable community workshop series of the National Center for Bicycling and Walking; he now provides technical training and community planning as an independent consultant. 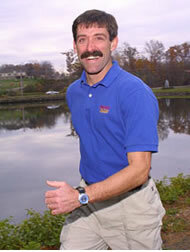 Mark was a member of the United States national racewalking team from 1986 to 1991, and competed in the 1984 and 1988 Olympic Trials in the 50-kilometer (31-mile) racewalk. He studied biomechanics at the Massachusetts Institute Technology, was a researcher at the Olympic Training Center's Sports Science Laboratory in Colorado Springs, Colorado, and manager of Reebok's Human Performance Laboratory. Mark has research publications and articles related to exercise science, physical activity promotion, and community level interventions. He's a vocal advocate for non-motorized transportation, a frequent consultant on bicycle and pedestrian community plans, and recognized authority on public health issues and the need for community, environmental, and public-policy initiatives to encourage more walking, bicycling, and transit use.